HUBBARD, Elizabeth Aimee. (nee Rayner). Of Carterton. On 28th March 2019 peacefully at Wairarapa Hospital, in the presence of family. In her 85th year. Dearly loved wife of the late Tom. Loved Nana of Alisa; Reuben, and Aimee; Jaimee, Hayden, and Liam and her 7 great grandchildren. Loved twin sister of the late June and a loved sister, sister-in-law, Auntie and friend to many. In lieu of flowers a donation to the Carter Court Trust, 95-97 Pembroke Street, Carterton 5713 would be appreciated and may be left in the Chapel Foyer. 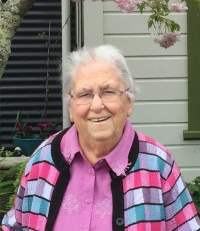 A service for Elizabeth will be held in the Richmond Chapel, Richmond Road, Carterton on Tuesday 2nd April 2019 at 11.00am followed by burial at the Clareville Lawn Cemetery.